The theatre is still, and Duse speaks. On parted lips, and eyes, and flushing cheeks! The hearts of women listen, deeply stirred. Confirming true that acted dream. It is I, it is I! My sighs renumbers, my old hope renews? I have buried my heart away, and none believed. At last, it is I, it is I! Comments: Laurence Binyon (1869-1943) was a British poet and playwright. 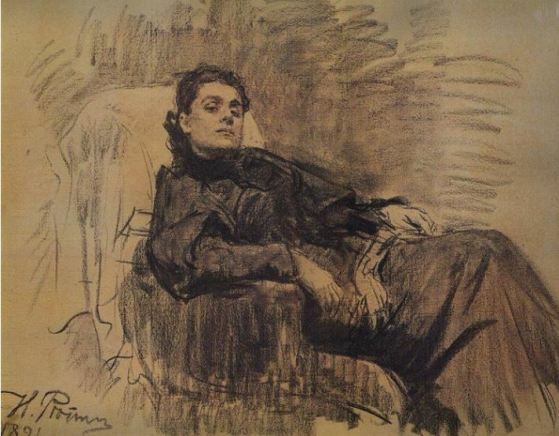 Eleonora Duse (1858-1924) was an Italian actress of worldwide renown, the performances celebrated for the depth of their sensitivity. She played Magda in the German playwright Hermann Sudermann‘s Heimat, entitled Magda for its British performances in 1895, the same year as Sarah Bernhardt also played the role in London. The production with Duse was at Drury Lane.